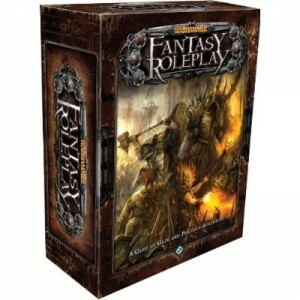 By now, your favorite retailer should have received its copies of the 3rd Edition of Warhammer Fantasy Roleplay—perhaps even already sold out. Of course, there’s been a bit of controversy over the new release, with many longtime fans of the game complaining about it becoming too much like a board game. I for one appreciate Fantasy Flight Games’ innovative approach to the property. But then again, I realize that some people like the freeform complexity and detail of a traditional roleplaying game. If you’re planning to stick with the 2nd Edition, you might want to get right over to Fantasy Flight Games’ website, as the company has said that it will be removing all support material as of December 4th! Also, a number of 2nd Edition print products are available for deep discount in the company’s Holiday Sale. For those who are going to make the switch (or will be playing the game for the first time), Fantasy Flight Games is launching right in to the support material. First, there’s the Adventurer’s Toolkit, which includes new careers, new party sheets, action cards, talent cards, and other stuff. Next up will be a boxed campaign set, The Gathering Storm.